The sleepy Outer Banks village of Corolla, NC began an unforeseen journey into the future in October of 1922. Northern Industrialist Edward Collings Knight, Jr and his bride Marie Louise LeBel took up winter residency in their newly acquired Lighthouse Club and began construction of a 21,000 sq.ft. private residence. Its location on Currituck Sound and the Atlantic Flyway was perfect to satisfy the Knight’s passion for waterfowl hunting. Three years and $385,000 later Edward and Marie Louise moved into their “cottage” on the sound. It was unlike any structure that local folks had ever seen or even imagined. Corolla Island’s Art Nouveau architecture, Tiffany lighting fixtures, copper shingled roof, yellow exterior and five stately chimneys stood majestically on the shores of Currituck Sound. It withstood hurricanes and northeasters, witnessed a series of owners, and entertained hundreds of visitors from 1925 to 1970. In 1940, the second owner, Ray T. Adams, renamed his new investment, the Whalehead Club, leasing it to the U.S. Coast Guard during World War II and entertaining guests and waterfowl enthusiasts when the war was over. The sequence of events that followed weave a fascinating and intriguing history, including a school for boys, testing of solid rocket fuel for America’s space program and development of the original 4 1/2 miles of land. The 1970’s and 1980’s saw the first spurt of development on the Whalehead tract of land with different groups of developers taking ownership. In 1992, Currituck County purchased the badly deteriorated Whalehead Club in the interest of historic preservation. Today, Whalehead is an intricate part of Currituck Heritage Park. Situated on 39 acres of sound front property, the public is invited to tour this newly restored “jewel by the sea”. 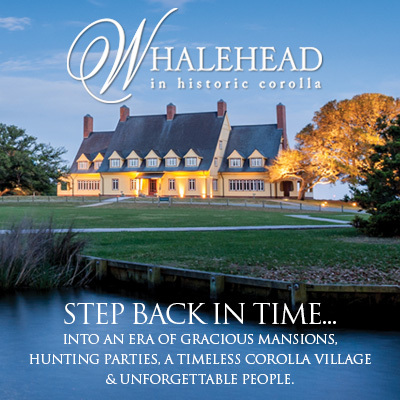 Please continue your online visit to learn more about the Whalehead and Currituck Heritage Park.